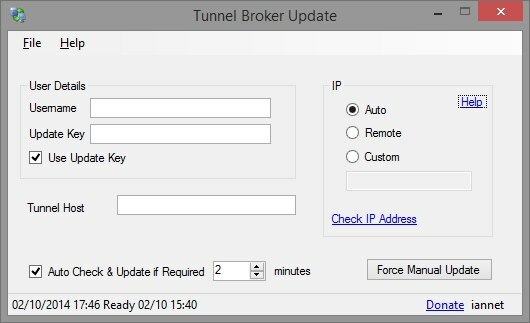 TunnelBroker Update is a tool to help you update IPv4 endpoint address of an IPv6 tunnel created with tunnelbroker.net service. This is a free tunnel service offered by Hurricane Electric. Many of use do not have a static IP and have a dynamic IP instead. TunnelBroker Update will automatically detect IP changes and push them automatically to Tunnel Broker. This program only supports updating one tunnel for the time being. Windows 2000, Windows XP, Windows 2003, Windows Vista, Windows 2008, Windows 7, Windows 8/8.1, 10, Windows 2012. Please Donate for TunnelBrokerUpdate. Thanks to all those who donated. UserID : Enter your user id. This you can get from the tunnelbroker.net main page. It is a long string of alpha numeric characters. Username : Enter your tunnel broker username. Update Key : Enter your update key. The update key can be set from the tunnel advanced configuration. Tunnel Host : Enter your tunnel reverse host. aka "user-#.tunnel.tserv#.loc#.ipv6.he.net"